Break the norm and make your big day unforgettable, not just for you, but your family and friends. 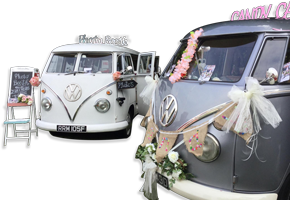 Turn up in style in our VW 1966 split screen campervan, fully customised to the colours of your wedding including flowers and ribbons. Our campers beautifully complement each other, so much more than just wedding transport. Create the perfect vintage wedding.